If you found yourself on an island out in the Gulf of Mexico 70 miles west of Key West, where do you think you might be…in another country, or perhaps another state? 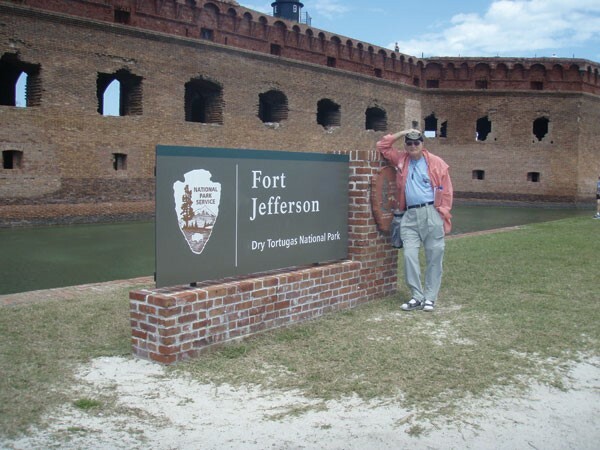 You would still be in the USA and in Florida and would probably be visiting Ft. Jefferson on Garden Key in the Dry Tortugas. 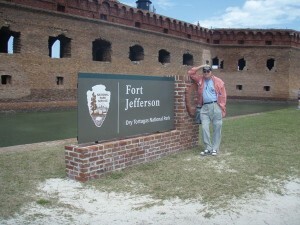 The Dry Tortugas and Ft. Jefferson are places not familiar to many people. When asked about the location, one person thought it was part of Cuba. Another thought it was a territory of the United States, and on it goes. The islands were discovered by that ubiquitous Florida explorer Ponce de Leon in 1513 and named by him for the abundant turtle life (Las Tortugas). Later on, because of the lack of fresh water, mariners added the label “dry” to their charts. In 1832 naturalist John James Audubon visited there, traveling from Key West to study the abundant bird and marine life. The next happening of note was construction of Ft. Jefferson, named for president Thomas Jefferson, by the U.S Army Corps of Engineers beginning in 1846. The Dry Tortugas are located along one of the world’s busiest shipping lanes. Its strategic location was seen as key to protecting shipping through the Gulf of Mexico and the building of a heavily armed fort was seen as a necessity in the mid 1800’s. Ft. Jefferson, designed to support 450 cannons, is the largest masonry structure in the Western Hemisphere. Construction went on for over 30 years, ending in 1875. During that time, never was a shot fired in anger. Although the fort was never finished, estimates are that more than 16 million bricks were used during its construction. Unless you have your own boat, for most visitors getting to what could be the most isolated national park in the Continental United States usually means a cruise on one of two speedy catamarans that leave Key West at 8 a.m. Arrival at the Ft. Jefferson dock takes 2 – 2 1/2 hours and the larger of the two craft, the 100 ft. Yankee Freedom II, can transport up to 100 passengers. Breakfast is served on board this ship and lunch is a picnic style buffet on the island. Now, why go there in the first place? The Dry Tortugas, with Ft Jefferson as its centerpiece, comprise seven undeveloped coral and sand islands. Far removed from civilization, this is a pristine paradise. Dedicated as the Dry Tortugas National Park in 1992, it covers 64,700 acres of mostly open water. Tales of the pirates who roamed this area are legend. The ocean bottom surrounding the islands is littered with shipwrecks, many are Spanish galleons laden with gold and other treasures, which are still to be found. Mel Fisher’s group is still recovering treasures from his famous find. Civil War buffs have a historic fort to explore. During the Civil War, Ft. Jefferson was used as a military prison for captured deserters. Dr. Samuel Mudd was imprisoned here. He was accused as being an accomplice for setting the broken leg of John Wilkes Booth after president Lincoln’s assassination. This was the last port of call for the Maine before it left for Havana where it was blown up, precipitating the Spanish-American War. On docking, guides are available for free 45 minute narrated walking tours of the fort. But there is much more available during your visit. Snorkelers are given gear before leaving the ship and are free to explore the shallow waters surrounding the island. Fishermen wander the beaches hoping to hook the big one. There is even free limited overnight primitive camping if you make advance arrangements and bring your own equipment. For birders, this is paradise. The islands of the Tortugas are in the main flyway from the United States to South America. Hundreds of thousands of sooty terns nest there as do thousands of brown noddies. You have to be a birder to appreciate these names. Countless other species can be seen on their seasonal migrations. The National Park service bird list for the Dry Tortugas includes 299 species.